← August is done. I’m ready to taper. All of this data comes from my Garmin, which has tracked (almost) all of my swims, bikes, runs, hikes, kayak paddling, strength workouts, and cross-country ski outings (which I brought a couple of top spotting scopes for bird watching along the way) for the last six months. What you see is all of that data analyzed by TrainingPeaks and transformed into a bunch of red and blue dots, a growing blue mountain range, and some very wiggly red and yellow lines. Each red dot is a day’s worth of activity. The higher the dot, the bigger the workout. The biggest workout of the last half-year was almost exactly three months ago when I raced Challenge Quassy. TrainingPeaks calls this the “Total Suffer Score,” or TSS. The blue dots are the intensity of the workout, based on heart rate and pace. 1.0 is theoretically working at threshold pace for an hour. Since most of the highest dots are swims, I’m a little skeptical of this part of the view. The blue and red lines are measures of fitness and freshness. Fitness is, basically, the positive result of all of that training. As you would expect, the more that I’ve worked out, the more fit I’ve become. 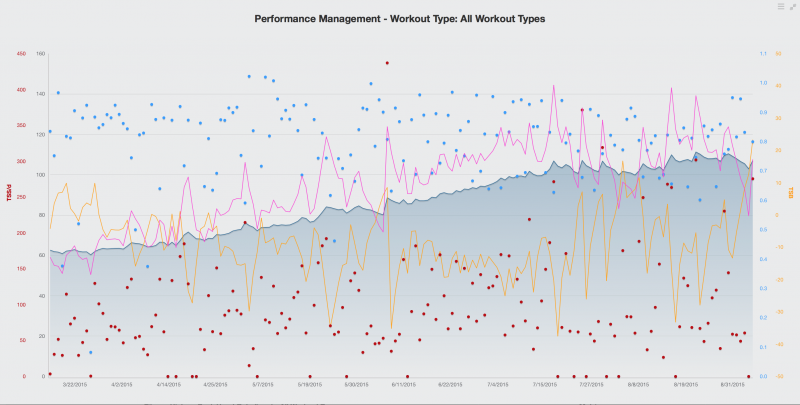 TrainingPeaks measures this on the blue line with what they call “Chronic Training Load.” All of that training comes at a cost, though: I’m tired. Some weeks I’m more tired than others, and this is mostly a function of how much hard training (“suffering” if you will) that I’ve done in the previous 2-3 weeks. The red line measures this “Acute Training Load.” You’ll notice that it varies a lot more quickly than the chronic load (blue line). The higher this red line, the more I’ve suffered recently and the less I likely can give to future workouts or races. All of this brings us to the yellow, “Training Stress Balance,” line. This is the ultimate measure of “freshness.” When this line goes negative, I have less than I can give to future workouts. When it’s positive, it’s more likely that I’ll be feeling ready to go, with muscles and joints that are up to the challenge. Of course, fitness and freshness aren’t any good without the other. If I’m not tired because I haven’t worked out, I’m probably not going to do my best. Same as if I’m very fit but overtrained. The key is to maximize both the blue line (chronic training load) and the yellow one (training stress balance). Yesterday I went back into the black with my training stress balance! Of course, I’ll dip down again after today’s third “do-it-yourself tri,” but I’m glad to see the taper is working. I should peak just in time for Ironman Wisconsin. This entry was posted in Cycling, Data-betes, Fodder for Techno-weenies, Reluctant Triathlete, Running, Swimming. Bookmark the permalink. I saw this post last year, but it was Greek to me. Now that I know more, I am so happy to have this. You are the best, friend!